The April 19th edition of BBC Radio 4’s ‘World at One’ – presented by Sarah Montague – included an item (from 33:34 here) that used Israel’s 70th Independence Day celebrations as a hook on which to hang the promotion of a political narrative and a campaign. Montague began by inaccurately claiming that the day of the broadcast was the day upon which Israel was founded according to the Hebrew calendar. In fact, the date of Israel’s Declaration of Independence is the 5th of Iyar, which this year fell on Friday, April 20th. Caroline Wyatt found it appropriate to open her item began with an archive newsreel recording in which the founders of the Jewish state were portrayed as “lawless” and “thugs”. She apparently failed to recognise the irony of a newsreel that described the same British authorities which had actively prevented Jews in both the pre and post-war eras from reaching safety in Mandate Palestine as the representatives of “law and order”. Listeners then heard an archive recording of Ben Gurion preparing to read out the declaration of independence – an event which Wyatt inaccurately claimed took place “at midnight” when in fact it took place at 4 p.m. so as not to run into Shabbat. BBC audiences are of course familiar with the style of commentary on the Middle East advanced by Eugene Rogan but nevertheless his promotion of the falsehood that there had been an entity called the “State of Palestine” before May 14th 1948 is remarkable. Listeners next heard from another academic who has also been a BBC contributor in the past and whose resume includes having been an advisor to Yasser Arafat – although that was not clarified. After an ostensibly ‘neutral’ academic and a Palestinian voice, Wyatt introduced her ‘balance’ – an American-born, UK resident interviewee who has a “complex” relationship with Israel. Levy studied at a yeshiva in Gush Etzion – an area in which Jews had purchased land and built communities years before the arrival of the British-backed invading Jordanian army in 1948. Radio 4 listeners were of course not informed of those narrative-spoiling facts and similarly Wyatt did not bother to clarify the role of Palestinian terror in her portrayal of ‘growing fences’. The item ended with that unchallenged and unquestioned promotion from ‘one-stater’ Ahmad Khalidi and no clarification was provided to BBC audiences to explain that what the Oxford academic is in fact touting is the demise of the Jewish state. 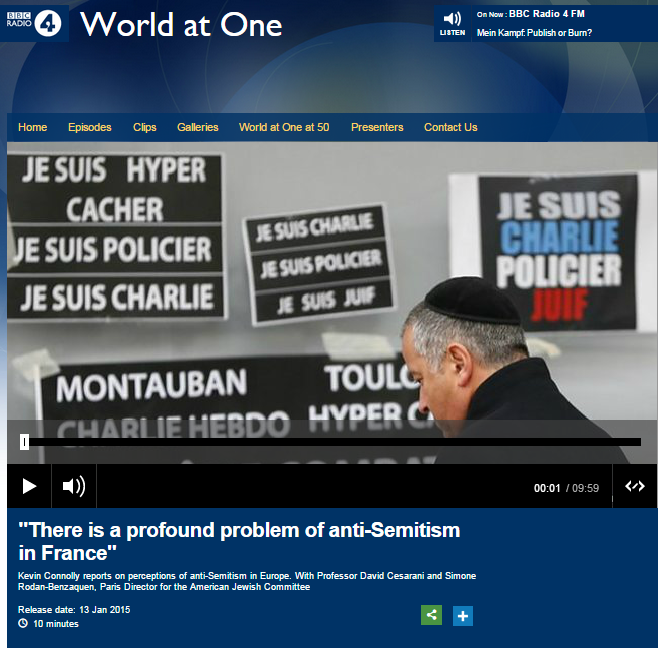 And not only did BBC Radio 4 find it appropriate to provide a stage for promotion of the campaign to end to Jewish self-determination on the very day that it was being celebrated, but the same item was also broadcast to BBC World Service listeners (from 45:05 here) in the afternoon edition of ‘Newshour’ on the same day. On March 26th BBC Radio 4 news and current affairs programmes understandably devoted a considerable amount of airtime to the topic of the letter put out the previous evening by the Board of Deputies of British Jews and the JLC criticising the leader of the British Labour Party and calling for a protest outside Parliament. One of those programmes – ‘World at One’ – seemed to attempt to present listeners with a more comprehensive view of the background to the story than others, but did that portrayal really give audiences the full view? Kearney then presented her first example and – in contrast to her colleagues at the BBC News website – was able to give an accurate portrayal of the mural concerned. Kearney then cited her next example of “accusations…levelled at Jeremy Corbyn”. Neither were ‘World at One’ listeners told that – despite the ‘explanation’ they heard for his use of the term ‘friends’ and the claim that it does not mean that he agrees with Hamas and Hizballah – Corbyn clearly expressed his opposition to the Jewish people’s right to self-determination in their own state: a stance categorised as antisemitism under the IHRA working definition. Martha Kearney’s next example referred to a story the BBC failed to report accurately at the time. Listeners then heard parts of Kearney’s 2016 interview with Livingstone, including his insinuation that “people” were “smearing and lying about” him and the claim that “if you’re a bigot, you’re not going to join the Labour Party”. Kearney closed that section of the item there, moving on to another related topic. Remarkably though, despite having aired Corbyn’s recorded response denying knowing who Dyab Abou Jahjah was, Kearney did not bother to inform listeners that – as the BBC itself reported in August 2015 – Corbyn subsequently claimed that he “must have forgotten meeting him in 2009”. Dyab Abou Jahjah (whose organisation had published a Holocaust denying cartoon three years earlier) was in fact at the same March 2009 ‘Stop the War Coalition’ meeting at which Corbyn called Hamas and Hizballah ‘friends’. Abou Jahjah was subsequently banned from visiting the UK by the British government: a decision he blamed on “the lobbying of the Zionists” while claiming that “MP Corbyn is filing a complaint against this disgrace”. Although this programme clearly did attempt to provide the BBC’s domestic audiences with more background to the story than other Radio 4 programmes aired on the same day, it is notable that while listeners did hear rather a lot of Jeremy Corbyn’s fairly standard evasive responses to the long-standing criticism against him, parts of the story that are highly relevant to full audience understanding of it – such as the fact that he did meet Dyab Abou Jahjah and his self-professed opposition to Jewish self-determination – were airbrushed from the portrayal. Last week we looked at the way in which the story of the US president’s statement recognising Jerusalem as Israel’s capital city was framed in reports on the BBC News website even before that announcement had been made. BBC radio stations likewise devoted coverage to that story prior to the actual announcement. BBC World Service radio, for example, aired items about that story in four different programmes in the twenty-four hours before the statement was issued. 1) ‘Newshour’ presented by Tim Franks (from 00:34 here). In that item listeners heard from the BBC’s Yolande Knell who did note the existence of the US’s ‘Jerusalem Embassy Act of 1995’, its recognition of Jerusalem as the capital of Israel and the waivers signed by US presidents since then. In addition listeners heard negative reactions to the anticipated announcement from the PA’s Nabil Shaath and from Jordan’s Prince Hassan bin Talal who misrepresented the 2004 ICJ advisory opinion on the “legal consequences of the construction of a wall in the occupied Palestinian Territory” as a “legal ruling” with no challenge from Franks. A negative opinion was also heard from the former advisor to US administrations Aaron David Miller. No Israeli voices were present in that programme. 2) ‘Newsday’ presented by Lawrence Pollard and Andrew Peach. The early edition of that programme included a re-broadcasting of the statement from Nabil Shaath, an interview with Israeli journalist Anshel Pfeffer and an interview with Mustafa Barghouti which was discussed here. A later edition included interviews with American human rights lawyer Brooke Goldstein and Saree Makdisi which was discussed here and a still later edition of the programme recycled a version of Barghouti’s comments and reporting from Yolande Knell. 3) ‘The Newsroom’ presented by Claire MacDonald. In that programme (from 00:05 here) listeners heard reporting from the BBC’s Jonathan Marcus and recorded statements from the PLO’s Manuel Hassassian and Israeli minister Naftali Bennett. 4) ‘Newshour’ presented by James Coomarasamy. In addition to reporting from the BBC’s Barbara Plett-Usher (from 00:05 here) listeners heard interviews with Mustafa Barghouti, Israeli MK Yoav Kish and a Jerusalem bookseller called Mahmoud Muna. Later on in the same programme listeners heard a problematic portrayal of Jerusalem’s history from British academic Mick Dumper which was discussed here. In all, listeners to those four BBC World Service programmes heard two from two American interviewees (one presenting the announcement as negative and one as positive), two Israeli politicians and one Israeli journalist. They also heard negative views from one Jordanian and one British academic as well as in interviews with Palestinian commentators that were promoted (including repeats) a total of eight times. In other words, negative views of the anticipated announcement got nearly three times as much exposure as positive ones on the BBC World Service in the twenty-four hours preceding the US president’s statement. Listeners to BBC Radio 4 heard the topic discussed in three programmes on the same day. That programme included reporting from the BBC’s Yolande Knell, Barbara Plett Usher and Jon Sopel as well as interviews with the mayor of Jerusalem Nir Barkat (discussed here) and the PLO’s Manuel Hassassian (discussed here). In that programme too Radio 4 listeners heard from Jeremy Bowen (from 18:09 here) who, while once again failing to mention the context of existing US legislation, gave a negative view of the anticipated statement. While BBC Radio 4’s guest list was more balanced than that of the BBC World Service, with the exception of Nir Barkat, listeners heard a very monochrome presentation of the story. Like the BBC News website’s coverage, these two BBC radio stations failed for the most part to provide audiences with the story’s essential context and refrained from providing the relevant – and accurate – historical background necessary for understanding of the story. Instead, their coverage was overwhelmingly focused on framing the issue according to a partisan political narrative. The June 6th edition of the BBC Radio 4 “analysis of news and current affairs” programme ‘World at One’ included an item (from 53:36 here) that is remarkable for its blatant and transparent attempt to shape audience opinion. 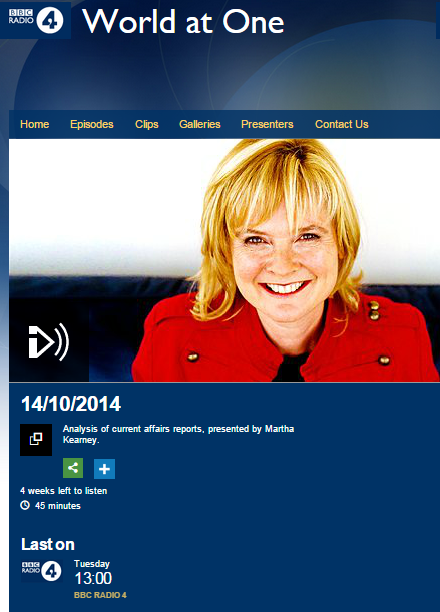 Presenter Martha Kearney began by establishing her interviewee’s credentials – clearly signposting to listeners that the views they were about to hear should be considered expert and authoritative. Armstrong responded by telling audiences what, in her ‘expert’ view, is not the cause of terror attacks in the UK and other Western countries. Listeners then heard a decidedly bizarre interpretation of the ideologies behind the Islamic State group – despite the rather obvious clue in the group’s self-chosen name. The item then got to its take-away point. Having spent nearly four minutes telling the BBC’s domestic audience that terrorism in Manchester and London has nothing to do with Islam and Muslim faith leaders, Armstrong left them with her ‘authoritative’ answer to the question of what is the “root cause” of such horrific attacks. So there we have it. BBC Radio 4 has brought in an ‘expert’ to tell British listeners that the real reason British citizens are being indiscriminately murdered on the streets is because the terrorists are radicalised by seeing “hideous” images from Gaza. And of course BBC audiences have in the past been told so often who is ‘responsible’ for those “hideous” images that there is no need to even mention the ‘guilty party’ by name in this transparent exercise in dog-whistle propaganda. Placement of a pay-walled article in a newspaper read by less than 5% of the population midweek was probably not the best advice ever given to a British politician apparently seeking to reassure Israelis but nevertheless, on July 18th the Labour MP for Bradford West, Naz Shah, had an article published in the Israeli newspaper Ha’aretz under the title “My Understanding of anti-Semitism Was Lacking“. The same sentiment was voiced by Shah in an interview with Becky Milligan on BBC Radio 4’s ‘World at One’ on the same day (from 29:11 here) and that interview prompted articles at additional outlets including the Independent, the Jewish Chronicle and on the BBC News website’s UK politics and ‘Leeds & West Yorkshire’ pages. The BBC’s promotion of the radio interview included a choice of language that – given its past approach to the same story – was remarkable. As readers may recall, when the story of Naz Shah’s offensive social media posts broke in April, the BBC refrained from informing its audiences that their content was antisemitic. In subsequent related articles, the corporation likewise gave audiences an anodyne description of just one of Shah’s controversial Facebook posts while ignoring the others. However, now that Naz Shah has herself acknowledged her use of antisemitic discourse, the BBC has redefined those Facebook posts and is suddenly able to tell its audiences that they were in fact antisemitic. So what happened here? Did the BBC really not know that before Shah’s admission? If not, then the fact that the corporation does not work according to an accepted definition of antisemitism has clearly once again failed audiences. If, on the other hand, the BBC was able to identify the antisemitic discourse in Shah’s posts back in April but nevertheless refrained from describing them accurately, then audiences have been similarly sold short. One cannot of course imagine that the corporation would wait until the writer of a homophobic or anti-black racist social media post defined them as such in his or her own words before it got round to telling its audiences exactly why such posts were offensive. A particularly noticeable characteristic of BBC reporting on the Paris terror attacks has been a general avoidance of any meaningful discussion of the actual issue of Islamist extremism. Instead, BBC audiences have seen, read and heard numerous commentators bemoaning the social conditions which supposedly turn disadvantaged and alienated youths into Jihadist terrorists. On other occasions, the Charlie Hebdo magazine has been described as ‘racist’ as though that misapplied label somehow provides relevant context to the premeditated murders of seventeen people. And in other cases audiences have been herded towards a view according to which if Jews are attacked in Paris, it is ultimately the fault of other Jews because of things they do – or do not do – in another part of the world. We will be providing additional examples in future posts, but here is one which appeared on BBC Radio 4’s ‘World at One’ on January 13th as the four victims of the Hyper Cacher terror attack had just been laid to rest in Jerusalem. The first part of this segment from the programme consists of a report from Kevin Connolly about French Jews to which we will return later. In the second part – from 03:50 – the programme’s presenter Shaun Ley introduces two interviewees: Simone Rodan-Benzaquen, Paris Director for the American Jewish Committee and Professor David Cesarani – described by Ley as “professor of history at Royal Holloway University of London” and someone who “has written extensively on Jewish history and is an authority on the Holocaust”. Of course contrary to the impression given in this item, it is not just the prime minister of Israel who talks about a rise in anti-Semitism in Europe; many bodies and organisations are recording and noting that trend, including the ADL, the CST and the Mayor of London. The French government had recognized the gravity of the situation even before the latest attacks. “…in 2014 the antisemitic incidents [in France] increased by 91%. All too often people forget that half of the incidents classified as “racial incidents” are directed against Jews. This, in spite of the fact that they form less than 1% of the general population. Under these circumstances it is understandable that the Minister of the Interior has recently declared that the “struggle against racism and anti-Semitism” is “a national matter”. As is all too often the case at the BBC, we see the Palestinian-Israeli conflict being promoted here as the conflict in the Middle East even as Jihadist extremists in Syria and Iraq continue to kill thousands of their own countrymen. Predictably too, we see the fact that Islamist extremism is a significant factor in the Palestinian-Israeli conflict being ignored and erased. Responsibility for the failure to bring that conflict to an end is of course placed entirely on the shoulders of one party to it and even one specific politician – despite the similarly unsuccessful attempts of his predecessors. According to Cesarani, the Palestinians have no agency and no role to play in finding a conclusion to the dispute but if only the Israeli prime minister would change his ways, then the “tensions” which he apparently believes bring about both antisemitism and terror attacks would “subside” and French, British, Belgian and Dutch Jews could live in peace. BBC Radio 4 clearly has no qualms about providing Cesarani with a soap-box from which to promote his own political views in the guise of ‘expert analysis’. That of course is an issue in itself, but the main point here is that listeners are being distracted from and misled about the real background to the murders in Paris by means of this superficial exploitation of a tragedy for political messaging. “It’s only fair to point out that Mr Levy blames the media at least in part for the current atmosphere and argues that it has tended to demonise Israel in recent years in the wake of events ranging from the first Gulf war to the first and second Intifadas. Actually, that is not “a debate for another time”: it is one in which some of us have been engaged for years already and it is also one which – as this Radio 4 programme once again indicates – it is long past time for BBC journalists to join. 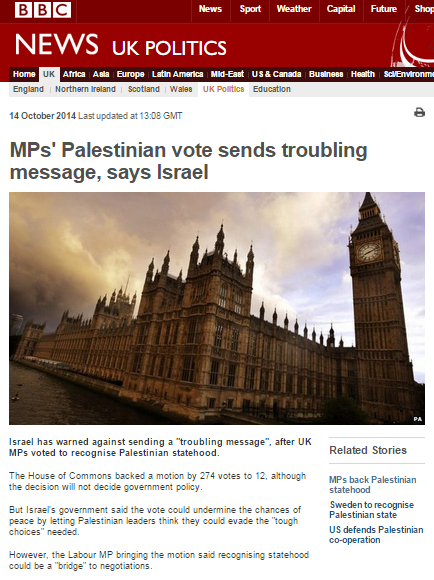 On October 14th an article appearing on the BBC News website was promoted under the heading “Israel criticises UK Palestine vote”. The report, which remained on the website’s Middle East page for three consecutive days and also appeared on the UK Politics page, was titled “MPs’ Palestinian vote sends troubling message, says Israel“. However, the 593 word article actually devoted less than a quarter of its content (116 words) to informing readers about Israeli government reactions to the previous day’s Commons vote. As well as presenting brief coverage of the views of the motion’s proposer and of the British government’s Middle East minister, the writer of this report chose to devote almost as much of his or her word-count to the views of another British MP as to the declared subject matter of the article. “In a speech on Tuesday morning, former International Development Minister Alan Duncan said the expansion of Israeli settlements was an “ever-deepening stain on the face of the globe”. Predictably, the BBC’s report went on to present the usual mantra which is promoted any time the topic of ‘settlements’ arises and yet breaches its own editorial guidelines on impartiality by failing to clarify to audiences that alternative legal opinions on the topic exist. The October 14th edition of the BBC Radio 4 programme ‘The World at One’ referred to in that article can be heard here for a limited period of time with the relevant item commencing at 38:00. Kearney fails to clarify to listeners that the Oslo Accords – willingly signed by the representatives of the Palestinian people – also define the issue of ‘settlements’ as a topic for final status negotiations and that nowhere in those agreements is any limit placed on either Israeli or Palestinian construction. The programme continues with an interview with Israel’s Ambassador to the UK, the introduction to which Kearney exploits for further BBC promotion of the misguided comments made by the MP for Croydon South during the previous evening’s parliamentary debate. Kearney’s use of a quote from Duncan’s speech to the RUSI in her introduction to this item indicates that before deciding to invite him to appear on this programme in order to further publicise it, ‘World at One’ staff read that speech (which, incidentally, does not include even one reference to Palestinian terrorism) and decided that its writer’s messages were appropriate content for unchallenged promotion by the BBC. From that – along with the fact that no attempt was made by Martha Kearney to correct any of Duncan’s inaccuracies or to distance the BBC from his use of an antisemitic trope – we can conclude that the programme’s producers, along with the BBC News website editors who also obviously found Duncan’s messages worthy of propagation to BBC audiences, were unperturbed by his employment of a multitude of lies such as “settler-only motorways” which of course do not exist and “persistent annexation of the West Bank” which has never happened. We can also conclude that BBC staff found nothing offensive in Duncan’s crude and cheap caricature of half a million people: an intentional attempt to create a stereotype which many would regard as deliberate and dangerous incitement. “In addition to being illegal, settlement activity is very often violent, nasty, and brutal. Not all, but many settlers are heavily armed and aggressive. But Alan Duncan’s courting of mob mentality is not just confined to demonizing and delegitimizing half a million Israeli men, women and children because of their postcodes: he also seeks to brand anyone, anywhere, who does not agree with his falsehood-based conclusions and crude stereotyping. “Anyone who considers settlements acceptable places themself outside the boundaries of democratic principle. Settlement endorsement should be put on a par with racism, sexism, homophobia and anti-Semitism. Indeed, just as we quite rightly judge someone unfit for public office if they refuse to recognise Israel, so we should shun anyone who refuses to recognise that settlements are illegal. Alan Duncan’s deliberate public promotion of illiterate and ahistorical populist lies should clearly be a cause of great concern to British voters in general and members of his party in particular – especially those who have previously spoken out against similar rabble rousing by George Galloway and the use of antisemitic tropes by David Ward. Duncan’s intentional propagation of crude stereotypes and his ugly incitement ought to render him unsuitable for public office – especially at a time when antisemitic incidents have just reached record levels in the UK and hence public figures should be doing their utmost to set an appropriate example. The fact that the BBC has elected to amplify Duncan’s pernicious message entirely uncritically both on radio and on its website is yet another dismal example of the way in which the corporation – all too often unable to resist any opportunity to promote content which reflects its own ‘progressive’ political agenda – contributes to the spread of bigotry which propagates the stereotypes that are seeds of the weed of antisemitism seen not only on Britain’s streets but, even more gravely, in its supposedly most respectable institutions.